Join us as we kick off our year in technology! This event will feature areas that will highlight different technologies and how they impact our lives. 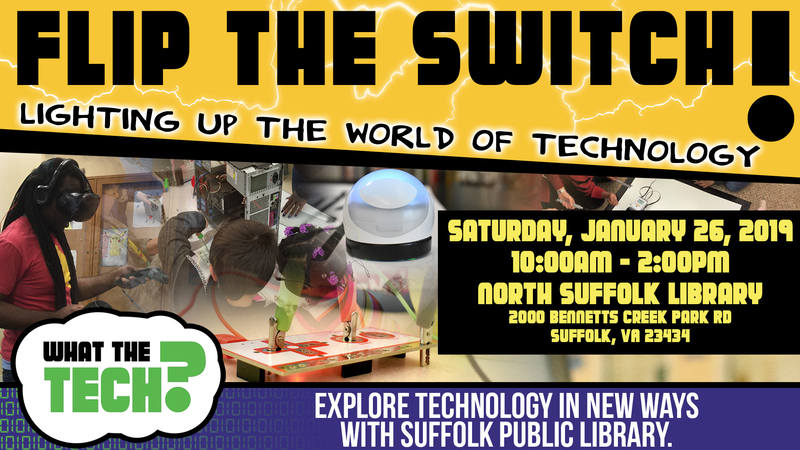 We'll hope you'll join us for a fun-filled day of tech! Code & Cogs will feature programs and demonstrations about coding, robotics, and more. In the Green Scene you'll learn all about the latest in green technologies that are helping to improve our environment. Stop by the Gaming Zone to play some video games and learn about gaming technologies and more. Compete in high score contests for select retro video games. Feeling creative? Then stop by the Make & Create area, where you can use techonologies to make art, crafts, and more. Registration not required. Families and all ages welcome. Invite your friends to attend through the Flip the Switch Facebook event page.